Radhanath Swami looked over as his students rapped on. After meandering along various topics, their conversation finally turned into a glorification session, each one glorifying the spiritual qualities of others. That’s something which devotees of Lord Krishna love to do. “Karunasindhu is so gentle. Wish I could emulate his gentleness,” said one. 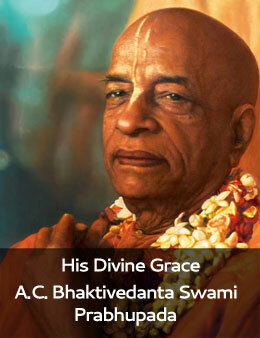 “Jagannath is so enthusiastic in Kirtan, wish I could be like him,” said another. You see this grass? It is happy to serve everyone, even by remaining in the most humble position under our feet. Whenever it is stepped on, it comes right back up, to serve. We can learn from this humility. Thank you Radhanath swami for giving us such a unique vision to see things. ..of all the qualities the most important is of that of a grass. Once again I am clean bowled by Radhanath Swami’s uncommon spiritual wisdom. Amazing humility of HH Radhanath Swami Maharaj which attracts everyone. Thank you for this inspiring incident. Radhanath Swami always teaches us some lesson from every incident and from nature. Radhanath swami always be humble and we should try to learn this humility from him. Great souls only aspire to become the dust at the feet of the lord and his devotees. Thank you for sharing this telling us how Radhanath swami is very humble at every moment. We should aspire to be as humble as grass by seeing the example of Radhanath Swami. Thank you Radhanath Swami for this lesson on humility.